Simply put, posture is our body’s position in space. To better understand the significance of posture, I like to compare our bodies to buildings. They are both structures that require a strong, stable foundation, and well-aligned supportive components to properly transfer loads. 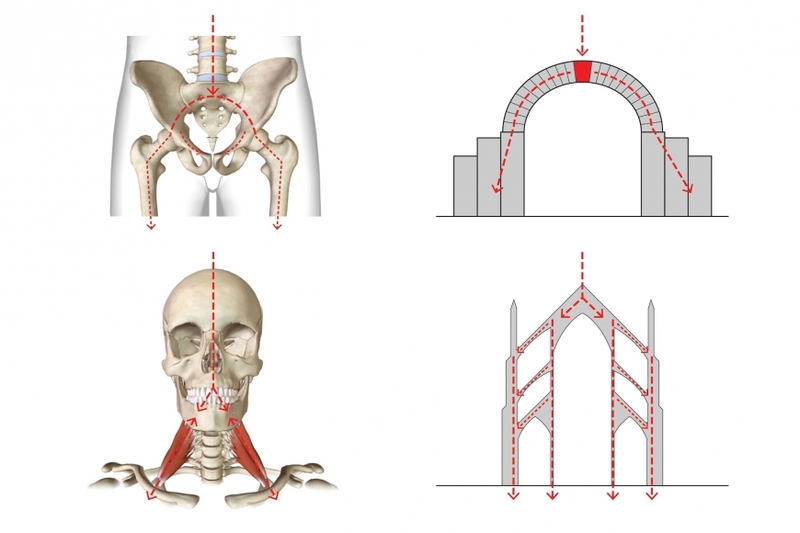 While buildings may utilize arches, buttresses, columns, and beams to provide support and transmit forces, we have bones, muscles, and ligaments. You can imagine in a skyscraper: if the foundation isn’t strong or if the columns aren’t aligned correctly, that building will have a difficult time staying upright (think Leaning Tower of Pisa). We humans are more fortunate than inanimate buildings in that we have a nervous system that allows us to adapt for poor alignment by activating different muscles to keep us upright. While this is an effective short-term compensation, it can have detrimental effects over time. Throughout the different areas of our body, some muscles specialize in stabilizing while others are meant to move our various segments. When we are in good alignment, these muscles are able to perform their proper roles, which ultimately results in minimal energy use. In addition, our postural alignment affects the congruency between our joint surfaces, which impacts the pressure in our joints and how well force is transferred. Thus, optimal posture results in a more efficient system, while sub-optimal posture can create more strain on our muscles and joints. If our joints, muscles, and soft tissues are put under strain for too long, this can result in pain and damage. Many conditions, such as tendonitis, bursitis, neck and back pain are caused by poor posture, creating imbalances in our musculoskeletal systems. That’s why your physical therapist may be focusing so much on your posture even though you’re going to therapy for a more “peripheral” injury, like Carpal Tunnel Syndrome. If you’re thinking, “I try to correct my posture all the time, but it’s so difficult to maintain”, you’re not alone. Like any object with mass, we are affected by the ever present force of gravity. In an efficient, properly aligned structure, gravitational forces can be well dispersed. As previously mentioned, we have the advantage of a nervous system that activates muscles to support our bodies against gravity. The disadvantage of this dynamic system is that it can fatigue. Therefore, even if you have obtained the ‘gold standard’ of posture and an efficient system, your muscles will eventually exhaust. So imagine if one segment of your posture is slightly out of alignment, such as a forward head. This creates a mechanical advantage for gravity, making it exponentially more difficult for the neck muscles to keep your head upright. Now consider our lifestyles of sitting at computers or looking down at phones for prolonged periods of time. Oftentimes, the ergonomic set-up of our work stations can put us in sub-optimal positions. However, even if one’s work station ergonomics are good, sitting (or standing) for 8 hours a day in the same position will eventually fatigue our postural muscles, resulting in that dreaded “slouch” position. While it’s definitely an uphill battle maintaining good posture, there are some things you can do to fight the good fight. First, try to optimize your workstation ergonomics, whether at work or at home, so that you’re at least starting off the day in a good position. Next, try to change your position or take an active rest break throughout the day. If you tend to sit, try to stand while taking phone calls. If you stand for prolonged periods, try alternating propping your foot up on a step-stool. Take a walk during your break or perform some gentle stretches. While static posture is extremely important, remember, our bodies are meant to MOVE. Interested in more information on how to optimize your posture and workstation ergonomics? Feeling the effects of too much time at the computer? Schedule an appointment with one of our knowledgeable therapists at your nearest PT360!